This weekend, my family attended our first church retreat at Calvin Center, a conference and retreat center about 45 minutes south of Atlanta. Situated near the edge of their lake is a large stone and sand labyrinth used for walking contemplation and prayer practice. 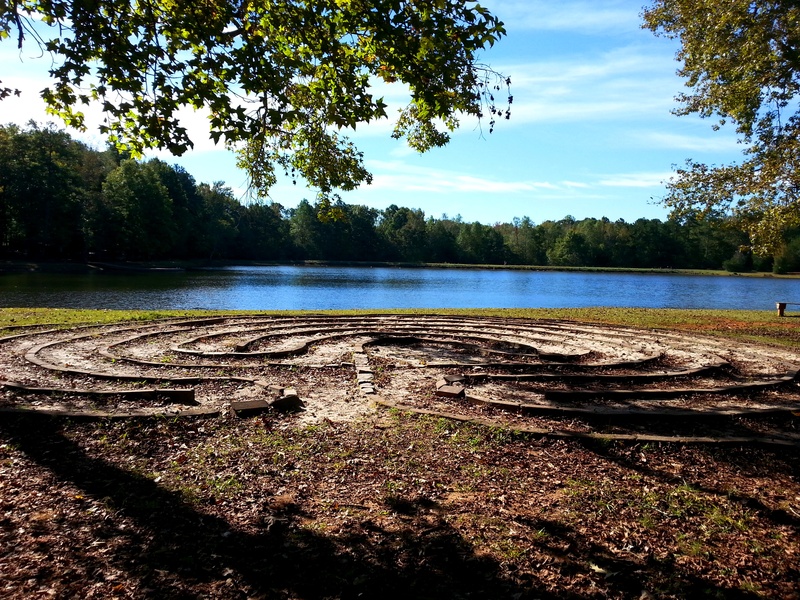 I walked the labyrinth soon after arrival, which helped to distance me from my usual daily concerns and toward a deeper connection to God during the retreat. Throughout the day, I noticed solo walkers in the labyrinth, as well as children jumping and cavorting among the circuit markers. As a sacred form representing the cosmic force, the labyrinth contains its own energy that we connect with and become attuned to during the walk. As a physical prayer space, the labyrinth can feel holy, inviting, intimate, playful – and to some, maybe even a bit intimidating. One of my favorite ways to “get right with God” has always been by walking. Walking the labyrinth, with fall leaves crackling underfoot and the sun shimmering off the deep green lake surface, is definitely a different experience than taking a walk down a trail or path. In the labyrinth, my focus is on my soul’s path and discerning internally how God is accompanying me on that journey. On the trail, my attention is often enchanted by the external presence of God around me and in all things. It’s much easier for me to say with certainty, “There God is!” while walking in the woods than walking in the labyrinth. Yesterday morning dawned dazzlingly bright, clear and chilly. After breakfast, my husband and I headed over to the labyrinth. Adults were still chatting over coffee and the kids were playing elsewhere, so the labyrinth beckoned a peaceful welcome. As I stepped into the path behind my husband and began walking, I became aware of several sets of footprints made by other labyrinth pilgrims. Some of the footprints went toward the center and some were heading back out. The spiritual life is a lot like that. It’s not a straight road converging into an infinite horizon line. We spin in circles, loop back and sometimes end up having to start all over again. Imagine what it might look like if you were to trace your footprints during your journey with God. Mine would probably look like a toddler scribbled all over a piece of paper. Yet, somewhere in there, a pattern or few would emerge. The other sets of footprints reminded me that we don’t make this journey alone. We are pilgrims sharing in the love and care of our spiritual friends accompanying us along the way. As I slowly made my way through each circuit turn, I expressed gratitude for the footprints of those who had gone before me, adding my own to theirs in solidarity. While walking toward the center of the labyrinth, I usually pace my steps with accompanying verse or short repetitive prayer that I received via inspiration. After reaching the center and pausing, I try to keep my heart open for God’s presence or message on the walk out. If nothing in particular reveals itself, I remind myself that a peaceful, quiet walk is still a walk with God. The structure of the labyrinth keep us centered on the path. Entering a labyrinth for the first time requires trust that it will bring you safely in and out. If your mind is uneasy, it can feel like it takes forever to reach the center. You might even feel a bit constricted by the gentle discipline of the pathway. If you stick with it, the cosmic energy of the Holy Spirit will guide you to the literal and spiritual center, wherein God dwells. I had begun making the circuit back out the labyrinth when down the hill came a friend and one of the younger kids. Quietly, they stepped into the path and began walking with us. Where there once were two, now there were four. A minute or so later, two older girls and a boy arrived and quietly joined us in the walk. Soon after, the mother of one of the boys arrived and quickly placed her son’s jacket on his shoulders as he rounded a turn. Hesitating for a moment, she quietly asked me for guidance on what to do, then began her own labyrinth walk for the first time. Stepping out of the confines of the labyrinth, I marveled at this unexpected gift – adults and children peacefully walking together – abiding in love, at their own pace and with reverence. The quiet energy and presence of walkers drew in others who placed their footprints with ours and joined the pilgrim’s journey. Walking back up the hill, I realized God had just shown me an answer to my prayer. Tags: Faith, faith journey, Holy Spirit, labyrinth, retreat, spiritual formation, spirituality, walking. Bookmark the permalink.